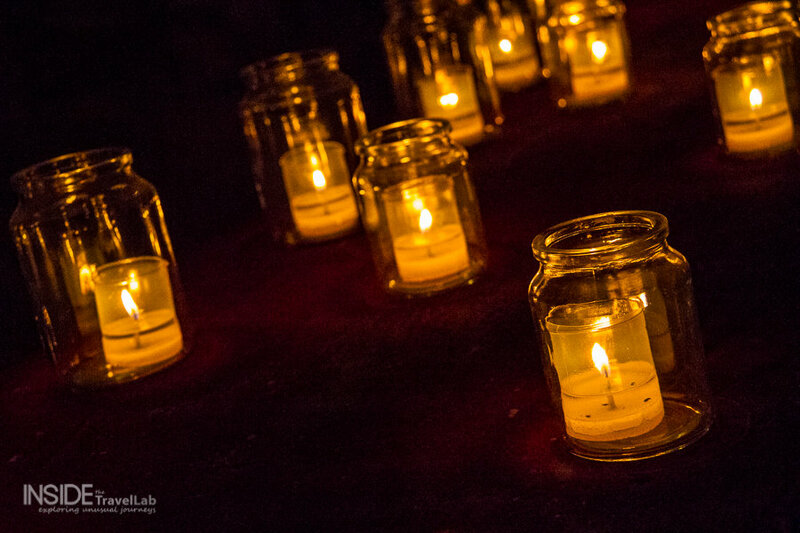 The Candle Festival of Malta has an official name: Birgufest but it’s the light of thousands of flickering candles that people remember the most. 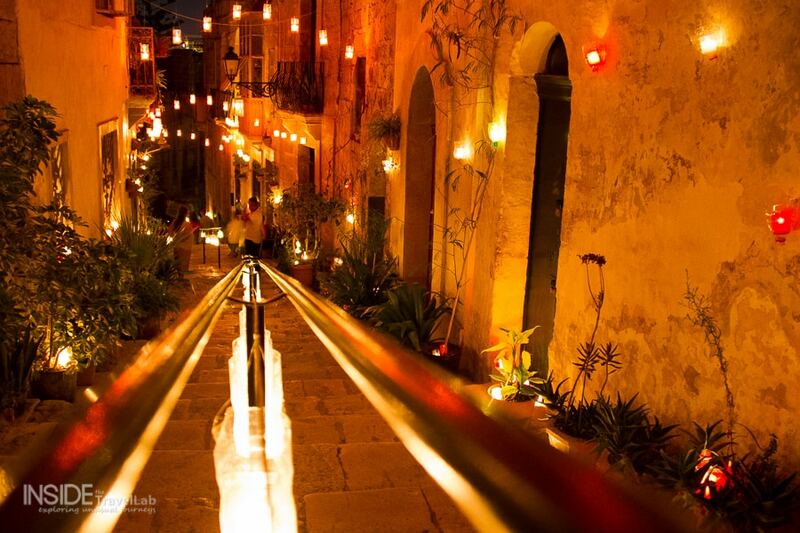 Here’s what it’s like to walk through the streets of Birgu, Vittoria, during the candle festival. And how you can do it yourself. I paused by the staircase of honey-slabbed stone. From the main square, the songs of a saddened but powerful woman drifted through with rhythmic beats. Streams of people flitted past, chatting, laughing, and stopping to scoop up heart-shaped vol au vents and the sweet pastry-wrapped dates known as mqaret. And the light, that from yesterday’s full moon and the doorsteps and balconies that dripped with homemade candles made a single word glow: reptiles. Reptiles, it said, in shaky, handwritten black felt tip letters. I left the crowd behind and followed the “reptiles” sign downstairs. 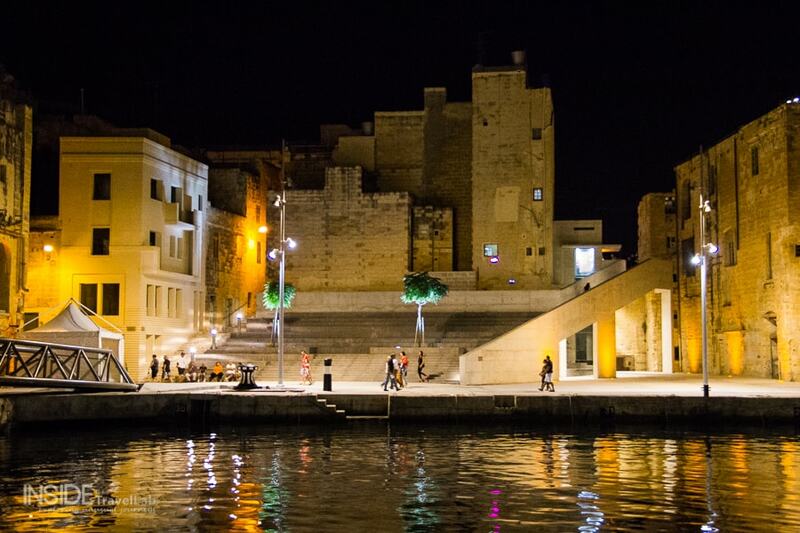 The staircase belonged to Birgu, also known as Vittoriosa, the former capital of Malta before the knights shifted ship across the water to nearby Valletta after a prolonged and profound city siege. Every year for Birgufest, residents fashion candles from what they can and drip them across the windowsills and wall fronts of this compact honeycomb labyrinth. Down by the water, restaurants cluster in the marina, the scent of the sea and of working life drifting up as traditional dgħajsas cross the lapping line to Valletta, all decked out in string lights and carrying shadow silhouetted tourists. Beyond the candlelight, the festival proceeds like many others. A stage speckled with spotlights forms a focus for the fun while at the edges, stall sell candyfloss, burgers, and palate-scraping cola sweets. Aside from the reptiles, which we’ll get to in a minute, other surprises walk my way. A local artist (Alvalenti by way of Siena) throws open his shop front, selling colourful miniature paintings of local Maltese landmarks. Red, yellow, blue boats with eyelash-locked eyes painted on the hull, the bell towers and the patterned balconies that overhang so many of the streets… and on closer inspection some cheeky comic characters. Elsewhere, a South African helps sell his Turkish wife’s hand painted stones. They bear slogans like “I dropped my secrets into the sea” and “every boy is a superhero sometimes,” accompanied by quirky tangled drawings. There’s wood carving and lace bobbins, fine filigree silver and glossy, shining ceramics dressed in yellow and Mediterranean blue. Then there are the museums, with doors thrown wide open beneath the fat shimmering moon. 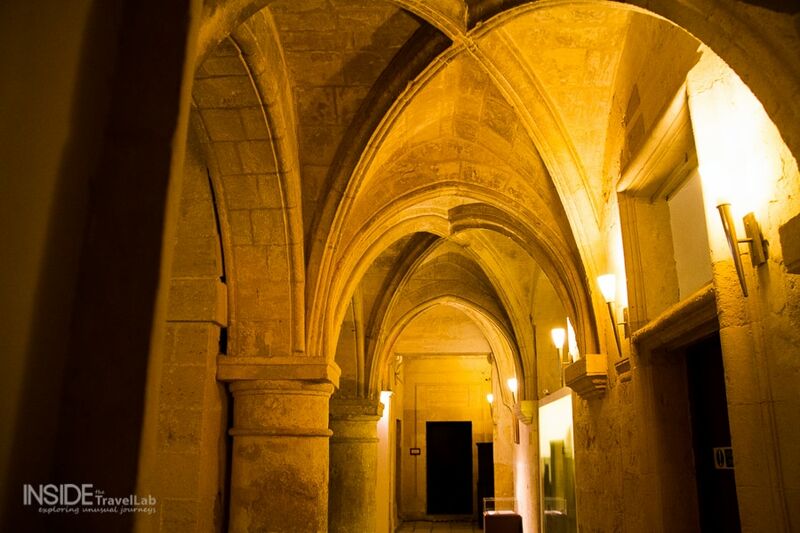 Birgu has Malta at War and the Maritime Museum but it’s another place that catches my eye: it goes by the name of Inquisitor’s Palace. The outside is charming, the inside more so. Great slabs of sun-kissed rock surround courtyards and Tudor-esque kitchens. Great robes wait in cases, glistening in purple and embroidered gold. The exhibition tries to emphasise the Inquisitor’s pastoral role as the spokesman for the Pope. It describes his staff, living quarters and administrative duties. But there’s only one thing I think of when I hear the word Inquisition – and that’s torture and punishment for refusing to believe. Eventually, this part is reached. The museum explains that punishment was frowned upon – that sentences were passed as methods to help heal the misguided soul through incantation, abstinence or what in modern days we’d call compulsory community service. The torture? Well, that was only when the accused refused to admit to what they’d done. Upon which I could write an essay. One of these days. Old parchments detail evidence, prescriptions, the mention of chocolate…It’s surreal to see such grisly history while the party marches on outside. In the basement, the cell doors slam shut but the beat of the bass remains though muffled and worlds away. In happier places, the Prince of Wales Own Band Club also throws open its doors. At first, I wondered whether I was about to stumble upon and actually meet the Prince of Wales with his own band but before I could find Charlie boy and the rockers, I found the Maltese kindness and hospitality I’d been hearing so much about. He mimed the chair breaking. He offered a wooden one in the next room. I stood, apologized and looked at the chair. Beneath chandeliers, impressive portraits and supported by plush velveteen carpets…I’d sat on a priceless heirloom. Back on the streets, festival fever washes away the awkwardness. Children skip and dance as though in a 1950s filmset. Grannies natter and the young n cool hang out on stone steps. The night wears on and the crowd thickens, the music pulses. It’s a kaleidoscope view of the islands themselves. At once beautiful, on deeper viewing complex, with shifting patterns of commerce and artistry, warmth and rigid rules, children, foreigners, locals, music, sweetness, salt…and reptiles. Ah yes, I forgot to tell you about those. The final touch, the missing zest, the absent cherry atop of icing that most festivals miss…is a snake and lizard demonstration in an underground cavern. This is the last in this summer’s exciting Must Love Festivals project (you can read more about that over here.) 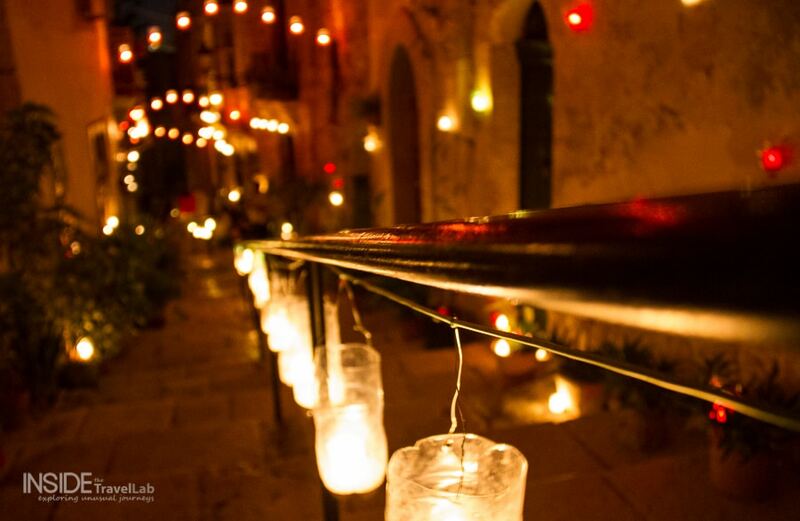 I travelled to this candle festival in Birgu with some assistance from the MTA (Malta Tourism Authority) and Expedia. 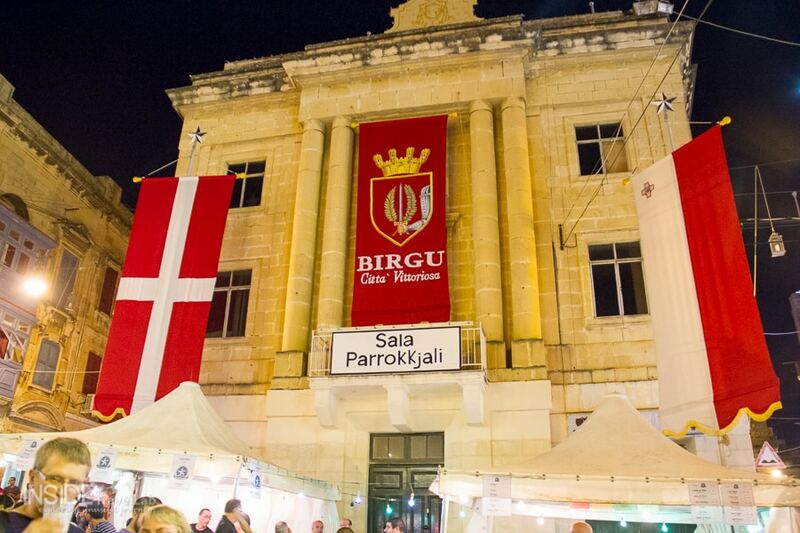 Birgufest is free to attend but transport in and out can be extremely difficult so it’s better if you can stay nearby. You can travel in by bus or water taxi but for getting home again you’ll need a taxi if you’re in the popular St Julian’s resort area. Bear in mind that most taxi drivers refuse to head here on festival night because of the traffic and you’ll need to book in advance and be prepared to hop out and walk. Have you ever seen reptiles at a summer music festival? Can’t say I’ve noticed any reptiles at any music festivals I been to but who knows, maybe they were there, lurking in a cavern waiting to be discovered. I’ll certainly keep an eye out in future! Hm…Well, yes, when you put it like that at least it’s better to be warned! Once again, beautiful writing and photos. What an interesting festival! Glad you ended up enjoying the festival! Definitely looked from the set up like it had some potential to be pretty interesting. Hehe! Well it was quite a challenge to get in and out but the streets themselves were a-m-a-zing. Really, really special. Plus the museums – they added an odd extra dimension to the whole affair. Malta is so magical! I felt super lucky to stumble on a summer festa when I was there in July. True – it’s so pretty all year even without a festival going on.